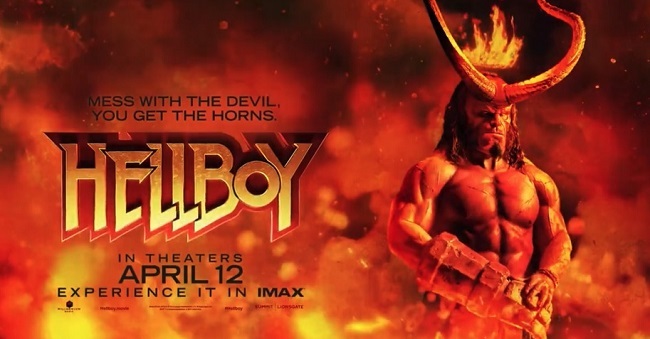 Hellboy begins with a pre-credits prologue, set in the Dark Ages and establishing the basic premise of the movie. Milla Jovovich plays the Blood Queen Vivian Nimue who unleashes a plague upon England (for some particular reason). She is defeated by King Arthur, dismembered and her body parts scattered to the four corners of the isle. It’s a graphic opening that clearly states the movies intent to be different to its predecessor. This reboot of the franchise aims to be gritty with liberal helpings of ironic banter and dry humour to offset the grim world the characters traverse. For those familiar with Mike Mignola’s work, this vision of Hellboy tries to embrace many aspects of established canon. The story broadly follows the comic books Darkness Calls, The Wild Hunt, The Storm and the Fury. There’s also an attempt to reflect the aesthetic of Mignola’s style. Yet all of this, along with the patent desire to be a R rated movie and to set itself apart from Guillermo del Toro’s versions, makes for a sprawling film that sadly over reaches itself. It’s hard to write about ones own personal health issues and how one addresses them without coming across as smug, sanctimonious or oblivious to the fact that it’s all relative. I wrote back in early March about how I was going to try and get my “house in order” by losing weight and also undertaking the NHS Health Check. A six weeks on and progress is being made. However, I would just like to re-iterate that what has proven to work for me, may not do so for others. We all have our own unique relationship with our own health and therefore there is a need to find ways that work for us as individuals. Therefore my dietary regime which seems some what easy to me, may prove to be far too draconian for others. Similarly my exercise targets are also suited to my temperament and limitations. But I hope that by sharing my progress I can at least provide some encouragement to others. “Do you still get excited about upcoming MMORPGs?” asked Massively Overpowered today. My first reaction was to say something flippant, so I left the following comment. “As I’ve got older, I’ve swapped excitement for schadenfreude. The ROI is far better”. However, upon mature reflection I think there’s more to this enquiry than meets the eye and that it requires a more thorough response. Because the more I think about it there seems to be a total lack of excitement from my perspective about any new MMORPG currently in development and more importantly, for those that I currently play. Both of which (The Lord of the Rings Online and Star Trek Online) have released a road map for the year ahead. Is a lack of any excitement indicative of an issue with me or with the genre of games that I have made a major part of my leisure time? The actor Shane Rimmer died yesterday at the age of 89. Born in Toronto, Canada, on 28th May 1929, Rimmer moved to London in the late 1950s to pursue his acting career. Over the next five decades, he appeared in numerous TV shows such as Doctor Who and The Saint, and in films including Dr Strangelove, Gandhi, Rollerball and Out of Africa. He starred in James Bond film The Spy Who Loved Me and had smaller roles in Star Wars, Superman and Batman movies. If during the seventies and eighties, a British production needed someone to play an American character, he was a one of a handful of "go to" actors who would take the part. Rimmer and fellow US actor Ed Bishop (whose paths regularly crossed) jokingly referred to themselves a "Rent-a-Yanks” as a result of this. At least once a month, Mrs P and I like to take a day trip and venture out away from suburban London, into the Southern counties of the UK. These excursions are mainly for leisure but they also serve as an opportunity to reconnoitre potential locations for a future move. As present we’re based in South East London, so a two-hour drive provides a wealth of interesting locations across Kent, East and West Sussex and Surrey. Travelling beyond these counties entails a longer drive and thus an overnight stay. Although we are not against such a thing, a simple day trip is more economical so is the more frequent choice. We like to visit English Heritage and National Trust sites, see local points of interest and natural beauty as well as try the local cuisine via local restaurants. "Why am I doing this?" is the question currently posed over at KeenandGraev.com and it certainly makes for some interesting introspection and personal reflection. Most gamers have at some point found themselves carrying out some arbitrary task in a game, pausing and then musing as to why they have chosen to do something as mundane and possibly even as tedious as “kill 10 rats” or “pick up nails” (yes, I’m looking at you LOTRO). Regardless of whether such mechanics are right or wrong, lazy or “classic”, grinding is an inherent aspect of most video games, especially the MMO genre. Players burn through narrative driven quest content far too quickly, therefore there has to be systems to slow player progress down and make then repeat content. However, the point of the original post isn’t to debate whether grinding is right or wrong. It’s about what you as a player do next when you finally ask yourself this question. categories / Gaming, MMORPG, Why Am I Doing This? After reading a lot of the recent coverage of Google Stadia, I find some of the comments and reactions from existing PC and console gamers just as “interesting” as the actual product itself. As for the basic concept of games running remotely at a datacentre, which does all the “heavy lifting”, we’ve been here before. On Live tried this in the UK back in 2009. They also had bespoke controllers just like Google Stadia but ultimately there was too many people in the UK at the time with low end internet connections, so the business failed. 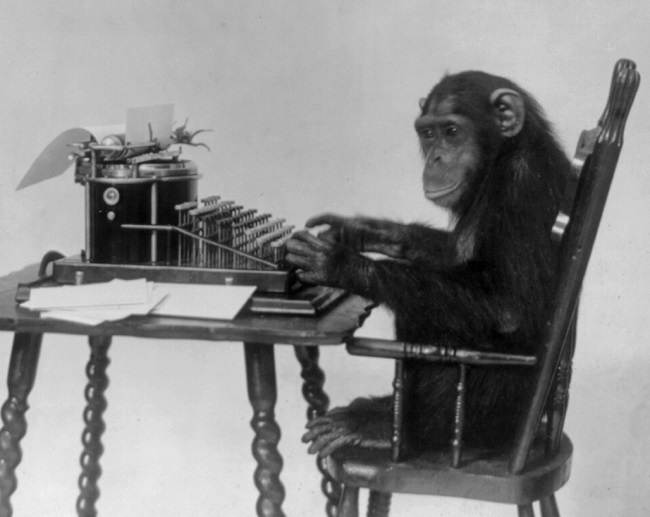 I believe Sony ended up buying all their patents. Obviously, technology has moved on in the last decade and certainly Google has more resources that it can bring to bear on the development of this product. But as I said, I find the way the news of this product was greeted to be of equal interest, because as ever core gamers are blinkered by their own erroneous perspective. They see themselves as the target demographic of any new service or game, which is not the case in this instance. 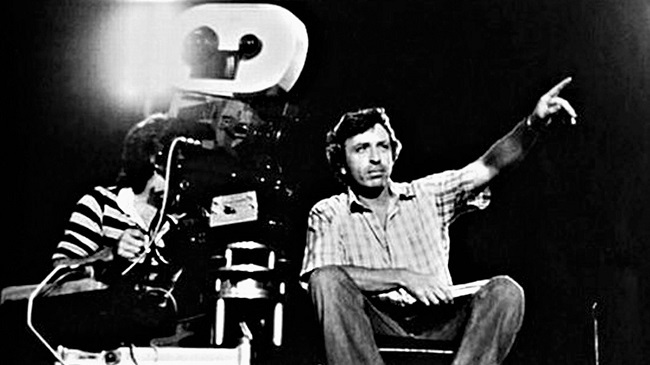 Larry Cohen, the writer and director of such cult films as Black Caesar, It’s Alive and Q: The Winged Serpent, has died aged 77. Cohen was a key figure in the genre movie community during the seventies and eighties, as well as writing scripts and storylines for mainstream TV shows such as The Fugitive and Columbo. He was a rare beast, in so far as he became one of a few writers who became known to wider audiences and fans, and gathered a cult following over time. Guillermo del Toro hailed him as “a true iconoclast and independent” and Edgar Wright wrote thanked him “For so many fun high-concept genre romps with ideas bigger than the budgets, for so many truly inspiring cult movies”. Los Angeles, 1928. A single mother Christine Collins (Angelina Jolie) returns from work to find her nine-year-old son gone. She calls the LAPD who initiate a search. Reverend Gustav Briegleb (John Malkovitch) champions Mrs Collins cause and publicly criticises the LAPD for its endemic corruption and incompetence. Five months later, a boy is found in Illinois who fits the description of the missing boy, Walter. Captain J. J. Jones (Jeffrey Donovan), the head of the LAPD's Juvenile Division, hoping to capitalise on a successful resolution to the case, organises a press conference when reuniting the Mrs Collins with her son. However, Christine quickly denies that the boy is Walter, stating that this child is three inches shorter than her own son. The authorities dismiss her claims and label her hysterical. Matters are further compounded when Mrs Collins joins Reverend Gustav in his public criticism of the police. The establishment subsequently closes ranks and attempts to intimidate and silence her. Inside a dark, remote warehouse, seven members of an unnamed midwestern militia meet. They’ve all heard via radio or police scanners that an unnamed, armed shooter armed with a modified AR-15 has opened fire on a police funeral. The assailant also plant IEDs and the casualty rate is therefore very high. This means the authorities will be scouring the countryside, raiding all known militia groups and their affiliates in the region. The men’s concern quickly turns to panic when they discover that one of their AR-15 is missing from their weapons cache, along with body armour and explosives. Is one of their own the shooter? Ford (Chris Mulkey), the group’s no-nonsense leader, asks fellow member Gannon (James Badge Dale), a former police interrogator, to question all the men and determine who is responsible. However, matters prove more complicated as Gannon knows that one other member, Noah (Brian Geraghty), is an undercover cop. Can a solution be found before the police inevitably come calling?